Are Quimbee Outlines or Quicklines downloadable or printable? Quimbee Outlines are no longer downloadable, but they are printable. They were previously downloadable as Word documents or PDFs, but the downloadable nature of the content meant that we couldn't include the Outlines in our monthly subscription plans. We found a new tool that allows us to embed a mobile-ready flipbook directly on our website. We are thrilled to be able to include Quimbee Outlines in our Gold Plan, Quimbee UBE Bar Review Package, and the Quimbee MBE Bar Review Package. The flexibility of offering Quimbee Outlines in our subscriptions and packages was our only reason for adopting this tool. You may view the outlines 24/7 on your desktop, tablet, or mobile device, which guarantees that you will always have access to the latest versions. Lastly, our Quimbee Quicklines are now incorporated into our Outlines; they are no longer available as separate files. Only interested in the Outlines? No problem! 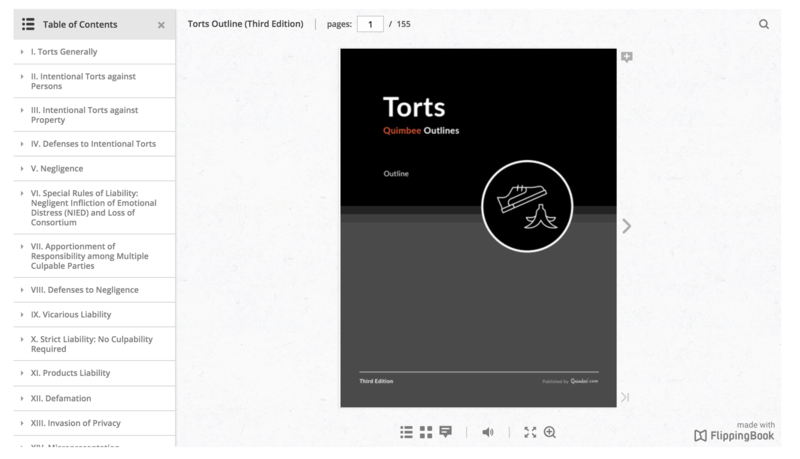 Quimbee Outlines are still available a la carte for $29 each. If you purchase (or previously purchased) Quimbee Outlines individually, you will still have lifetime access to the most current edition of our Outlines by simply logging in to your Quimbee account (no subscription required!). The Quimbee Outline reading experience also got a massive upgrade. Using the handy buttons on the bottom, you can (from left to right) expand and collapse the table of contents, view thumbnails of all the pages, add helpful notes or comments for yourself, turn the page-flip sounds on or off, and expand the page to full screen or zoom in. Plus, because Quimbee Outlines are fully optimized for mobile viewing, you can zoom in and pan using your device's standard gestures (e.g., pinch to zoom).